It all began with the inspirational sailing movie, Dove. 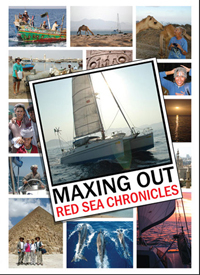 Dave Abbott began to dream that he too could sail across oceans. 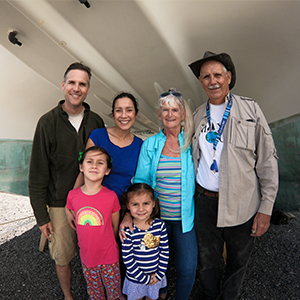 Dave and Donna Abbott started learning to sailing in the Panama Canal zone and around Puerto Rico during their Navy days. 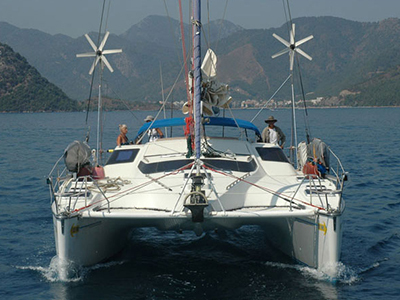 In 1994, the Abbott family of Dave, Donna, Wendy (15) and David (14) set sail for a 2 year circumnavigation aboard their Privilege 39 catamaran, SV Exit Only. Dave Abbott's dream of bluewater cruising was finally coming to fruition after years of preparation and saving. The Abbotts cruised through the Caribbean and South Pacific, discovering all the pleasures the cruising lifestyle had to offer. They finally made their way to New Zealand. Unfortunately, the dream of completing their circumnavigation was cut short by a serious car accident. Although they were able to periodically come back to SV Exit Only, the family put their circumnavigation dreams on hold for another 10 years. 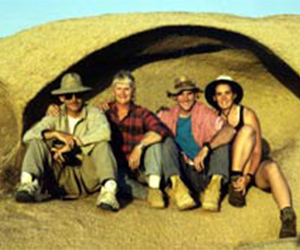 In 2004, Dave, Donna, David and Sarah (David's wife), set sail from Australia. 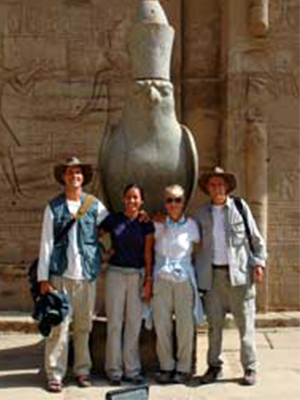 Over the next 2 years, the intrepid adventurers made their way through SE Asia, crossed the Indian Ocean, made their way up the Red Sea, sailed the Med and finally conquered the Atlantic to arrive back in the US in 2006. They had survived the deadly tsunami of 2004 in Thailand. They had eluded Yemini pirates in the Gulf of Aden. They had made lifelong friends and memories along the way. They had achieved their dream of circumnavigation. Another 10 years passed. Dave and Donna were back in the US and looking towards retirement. David and Sarah now had 2 young girls (Zoe, 5 and Joss, 2). And SV Exit Only was sitting on the hard in Florida, just waiting for another adventure. So what if we did it again ... For all of us, the call of the ocean and the desire for adventure was there. To be able to share our love of cruising and travel with a new generation was exciting to consider. And so the planning began again ... and here we are! Ready for another season of sailing adventure. We hope that you will follow our journey! The Privilege 39 catamaran is built for off shore sailing and will take you anywhere you want to go in the world. That being said, a catamaran this size is designed for downwind sailing in the trade winds rather than the high latitudes of the artic. The Privilege 39 is built to the touch Bureau Veritas standards and is certified by the French government for offshore sailing. Exit Only is substantially heavier tha most catamarans its size. That means it's not a speed machine but more like a tank. So if conditions get nasty, it will survive. Exit Only is essentially unsinkable. It has 4 water tight compartments in each hull. If you knock a hole in one of these compartments, the boat will not sink. When Exit Only was delivered in 1994, an eight inch hole was knocked into the starboard bow. The collision bulkhead (which is about 1 foot back) stopped water from entering the next watertight compartment. So the yacht was never at risk of sinking. Redundancy is the name of the game on Exit Only. We have 2 steering wheels. This excellent design means that a broken steering cable is not a big deal since you have separate steering system. Exit Only has never had to deal with the hellish experience of a broken steering wheel or needed an emergency tiller. Exit Only has 2 rudders. If one rudder was inoperable or disappears in the sea, you still have modest control of the yacht. 2 engines provide manueverablility, increased horsepower as needed for conditions, and peace of mind knowing that in an emergency there is a spare engine to get your through. Each of our engines has its own fuel systems. So if one fuel system is contaminated, the seocond will be able to continue running without interruption. Modern sailboats need a lot of electricity to keep all systems up and running. Exit Only has 2 primary sources of energy for electricity: wind and solar. 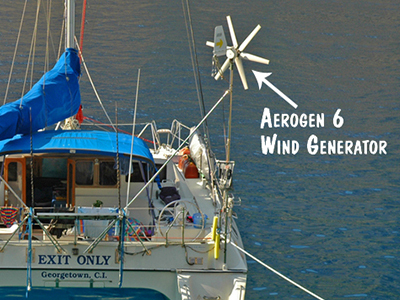 We have 2 Aerogen wind generators. Together they can pump a combined 200 amp hours into the battery banks on days that we were in the trade winds. Exit Only has one large solar panel which helps provide critical redundancy in the electrical system. It can provide up to 360 watts daily. Exit Only uses a double headsail downwind sailing rig assisted by 2 eighteen foot spinnaker poles putting 1000 sq feet of sail out in front of the yacht. 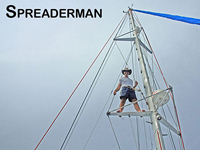 This allows us to cruise effortlessly downwind in the trade winds day after day. 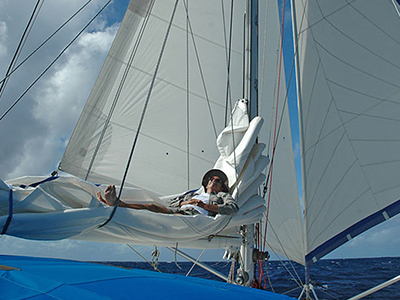 The double headsails can been reefed and it puts the center of effort of the sails at the bows. This pulls us downwind with a balanced helm. The helm is so well balanced that the autopilot can almost go on vacation -- it has so little work to do as it keeps the boat tracking downwind. Exit Only has an Autohelm 7000 autopilot that puts out 1200 lbs of linear force directly into the steering quadrant. We keep a compelte spare autopilot on board, and have had to use the spare only twice. In French Polynesia, a failed bearing stopped the autopilot until the bearing was replaced. And while saling up the Great Barrier reef, we stripped the epicyclic gears in the autopilot and we had to replace them while underway. This autopilot served us well during our 33,000 mile circumnavigation. Exit Only on required hand steering for less than 100 hours total. Exit Only currently has a 70 lb Beugel anchor. We dragged our CQR anchor all across the Pacific Ocean. It didn't matter if we used our 45 lb or 60 lb CQR. We dragged them both causing quite a few sleepless nights. The problme with the CQR design was that it was difficult to set in marginal bottoms. 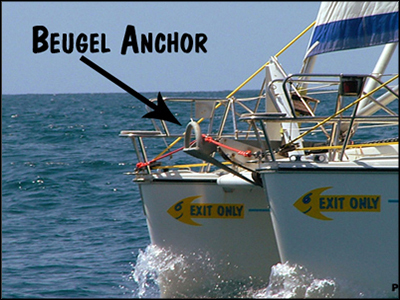 It could not be trusted to reliably reset when the wind and current changed the pull on the anchor. 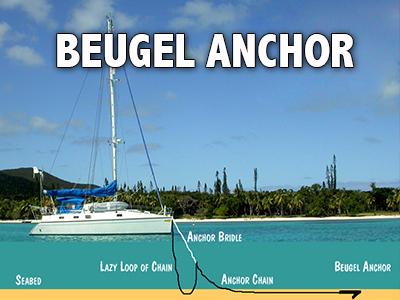 Once we got our Beugel, our anchor dragging woes were over. The Beugel sets quickly and resets well when there is a change in the wind or tide. It also works well in tight anchorages. In the 15,000 miles sailing from Australia to the Caribbean, we had the anchor only drag twice. When we put the anchor down, we back down on it with both engines in full reverse. So when the anchor is firmly set, we can sleep soundly through the night. And finally, Exit Only has 2 stainless steel chain plates bolted through the decks at the bows. There are large diameter stainles steel bails welded to the chain plates. And the bails are a chafe free attachment point where I can shackle my parachute storm anchor if we ever get in a mega storm. The chainplates are 25 inches long and they will never pull out of the deck even in extreme conditions. The remainder of the features on Exit Only are fairly standard for a cruising yacht, including radar, HF radio, VHF radio, EPIRB, satellite phone, GPS, C-Map electronic charts, complete survival gear and emergency gear, Givens 6 man life raft, and a reverse osmosis watermaker. 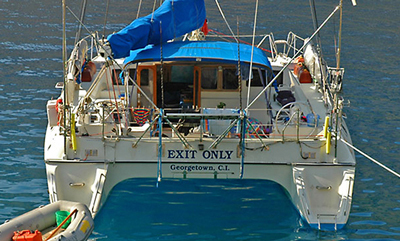 Exit Only has been our home on the high seas for more than 11 years. She's an honest Dream Machine that has lived up to our expectations and taken us safely around the world. You can't ask much more that that from any yacht. 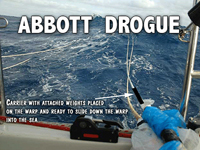 Abbott drogue: Adjustable medium pull drogue for up to 50 knots wind made with available material.